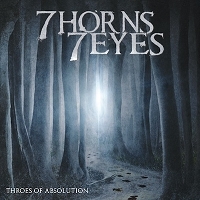 Hailing from US Seattle, the progressive death metal group ‘7 Horns 7 Eyes’ is bringing “death & destruction” to the world, with their debut album ‘Throes of Absolution’ released in Europe on 23rd of April by Basick Records. With a self released EP in 2006, that caught the attention of the guitar virtuoso Jeff Loomis (ex-Nevermore), they managed to get added on the list of artist at Basick Records and Century Media Records, and unleash this beast with “seven horns & seven eyes” to the humankind. After the release of the EP, front-man Kyle Wood was replaced in 2010 and the band re-recorded all vocals, toured and released a digital single ‘Convalescence’ in 2011, so the fans have been waiting with patience. This debut album includes 9 tracks of which 3 songs were already released on the digital single from 2011. The talented quintet of 7H7E is Ryan Wood on drums, Aaron Smith on rhythm guitar, Sean Alf on lead guitar, JJ “Shiv” Polachek on vocals and Aaron’s brother Brandon Smith on bass. The dark, ambient and crystal clear hellish release is produced and mixed by guitarist Aaron Smith with the help from Master Jens Bogren (Opeth, Amon Amarth) and Andy Sneap (Megadeth, Killswitch Engage). The amazing dark atmospheric artwork is crafted by Travis Smith (Nevermore, Katatonia) and still haunting me in my dreams. With the talents of all these skilfully craftsmen and the godlike shredding abilities by Loomis, this dark precious pearl is polished and ready to be released and setting very high expectations. My old bones are still shaking after the beast has chased my mind through 9 tracks of progressive atmospheric death metal. The onslaught begins with the cinematic opener of ‘Divine Amnesty’ with some orchestral tunes that makes your mind rest easily a minute, just to let the beast make an surprise attack at your eardrums, with the deep brutal growl from “Shiv”, aggressive guitar tunes and heavy fast pounding drums by Ryan. The track continues with aggressive guitar shredding and solos that will show us a smile of respect in the face of Mr. Loomis. All the growling, guitar shredding, melodic passages and thick fast heavy drumming are beautifully layered on top of the always haunting keyboard tunes, creating a breathing beast from hell. And so it continues on the following tracks, guiding us through the same atmospheric forest of darkness, sounding almost to monotone, still the technical skills of the guitarists must be a gift from the gods. Just listen to the tracks ‘Cycle of Self’ and ‘A Finite Grasp of Infinite Disillusion’, both of which uses complex song structures heavily influenced by the prog death master Meshuggah. Even this untamed beast has its own melodic groovy style; the track ‘The Hill Difficulty’ perfectly demonstrates that. The deep growling vocals by “Shiv” are outstanding. He surely knows how to control it, but his pipes are lacking diversity at times, that would have lifted the overall impression of this album beyond the exceptional. Still it must be one of the best progressive death metal experiences released this year. My ears are still glued to my earphones and can’t escape this beast from hell. If you always wished a child from Meshuggah and Scar Symmetry, you should try “babysitting” this beast, that has 7 Horns & 7 Eyes.